The norms for regular accreditation also reads that “He should ordinarily have five years’ Court reporting experience in a daily newspaper and/or a national or international news agency or electronic Media Organization of which at least three and a half years must be at Supreme Court or at any High Court(s) in India.“ .Identity cards will be issued to the accredited journalists/correspondents. For temporary accreditation, only three and a half years’ experience is required, of which two years should be from High Courts, but however Law degree is requirement in both type of accreditation. The revised norms also require the correspondents to be in formal dress in court premises and should prominently display his accreditation ID card. It also asks them to maintain decorum in court. It adds that the correspondent should make a serious endeavour of reporting a faithful account without any distortions and embellishments. The circular also says that the accreditation can be withdrawn, at any time, without assigning any reasons. Last week Justice Ranjan Gogoi directed legal journalists in the apex court to observe restraint while reporting the exchange between the judges and lawyers. Noting that reporter’s should remain at arm’s length and in their designated space within courtrooms, Justice Gogoi said the Supreme Court’s Press Accreditation panel has decided against journalists entering the ‘Well’ – the space between the arguing counsel and the elevated dais of the sitting judges – in the courtroom. “Don’t rush to the Well,” Justice Gogoi said. When the journalist concerned retreated, Justice Gogoi jovially called to him to not do so and stay on. “May be, the decision of accreditation committee has not reached you. You should be at your place,” the judge said. “Most of the judges do not like to be quoted about their observations made during a debate. In the course of the debate, we make certain tentative observations. We say without mincing words,” it said. 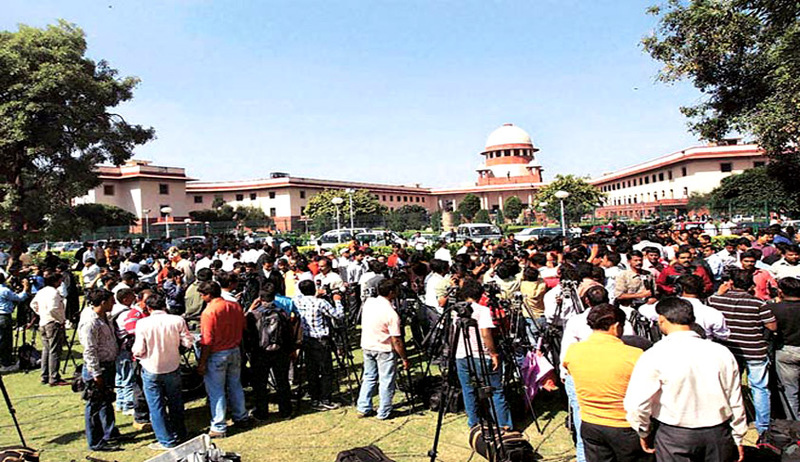 Read the revised norms for Supreme Court reporting.